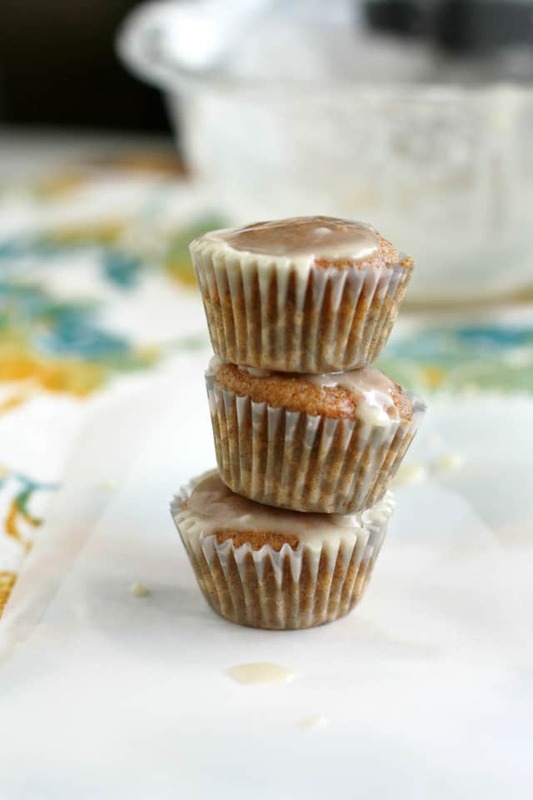 Home » Breakfast » Vegan Carrot Muffins with Sweet Glaze. 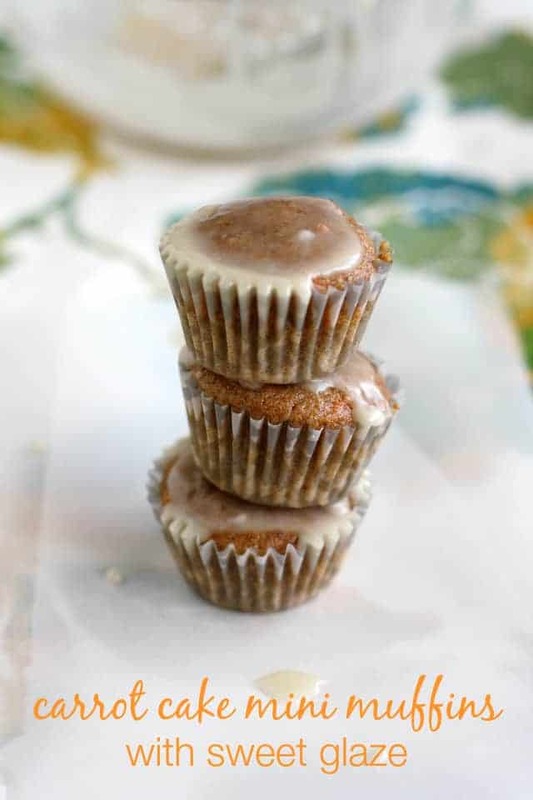 These vegan carrot muffins are topped with a simple dairy free glaze. Sweet, delicious, and free of dairy and eggs. These vegan muffins are perfect for a breakfast or brunch! If you have a child that’s a picky eater, you know it can be difficult to get them to eat vegetables. Anything new or different, or too green, or too orange, or too leafy gets a resounding “no” from the child. These vegan carrot muffins were my sneaky way to get my youngest son to eat some extra vegetables. :) He loves pancakes and muffins, they are his favorite. He’s a real carb lover, this guy. And it’s fine, because he eats a lot of other foods too, but I thought I would sneak some veggies in this time. Plus, carrot cake is awesome – one of my favorites. You can easily make these vegan carrot muffins full size, I would just double the recipe, and I would guess that it would take about 18-20 minutes or so to bake them. We did mini muffins because my boys like the mini size better. I kept the glaze kind of thin, but if you prefer a thicker frosting, just use less non-dairy milk. Don’t skip sifting the powdered sugar first – you don’t want lumps in the glaze! Can I use all-purpose flour in place of spelt flour? Yes, you can use all-purpose flour or whole wheat flour in this muffin recipe. It will work just fine! Can I make these with gluten free flour? You can make them with gluten free flour. Try my gluten free flour blend, or a store-bought blend that doesn’t contain xanthan gum to keep these light and fluffy. I can’t have flax seed – what can I substitute? You can just leave the flax seed meal out – this recipe will work without it. Vegan Carrot Muffins with Glaze. 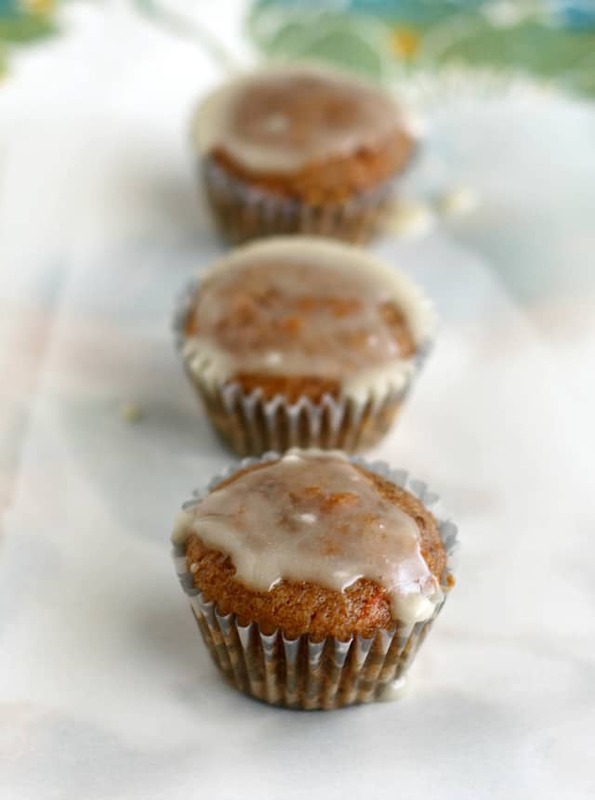 Vegan carrot muffins with a sweet glaze - perfect for a snack or dessert! Preheat the oven to 350 degrees. Line a couple of mini muffin pans with paper liners - this recipe makes about 18 mini muffins. Place the grated carrots in a bowl with a little bit of water and microwave on 70% power for a minute. This will just soften the carrots up a bit since the baking time on mini muffins is so short. Mix the melted buttery spread and sugar together. Add the grated carrot, vanilla, vinegar, and non-dairy milk and stir. Whisk together the dry ingredients in a separate bowl. Add the wet ingredients to the dry ingredients and mix to combine. Place the batter in the mini muffin tins and bake at 350 degrees for 10-12 minutes. Make the glaze: Sift the confectioner's sugar into a bowl. Add the non-dairy milk a little bit at a time while whisking the glaze with a fork. If you want a thicker glaze/frosting, use less non-dairy milk. Drizzle the glaze on the cooled muffins. 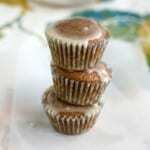 Store leftover muffins in the refrigerator in an airtight container. Nutrition facts are for 2 mini muffins. Store muffins in an airtight container. They should stay fresh for three days. You can freeze the muffins before you glaze them. Just place them in a ziploc freezer bag - they should last for 3 months. This recipe was originally published in April 2016. « Lemon Dill Zucchini Noodles. We’ve got friends with flax allergy (and we’ve got top 8 allergies) what purpose does flax serve here? Is it an egg replacement or just for texture? If I leave it out, will I need to sub something else? Thanks! PS. Are the comment bees new? Or have I just never seen those? They’re too cute! Your site looks great! So fresh. I love a nice clean look, it’s so inviting :) And by the way, these treats look incredible! I will eat anything carrot cake-related! I love it all! These look awesome! The glaze definitely takes these over the top too :-).